Jumbo NOLA Gumbo. Even better the next day, leftovers for Dumbos! Recently I shared a tasty little bowl of Gumbo with his Lordship at Disneyland (see review) and was inspired to make some at home. I gotta tell you, as I write this, the house smells most splendid. 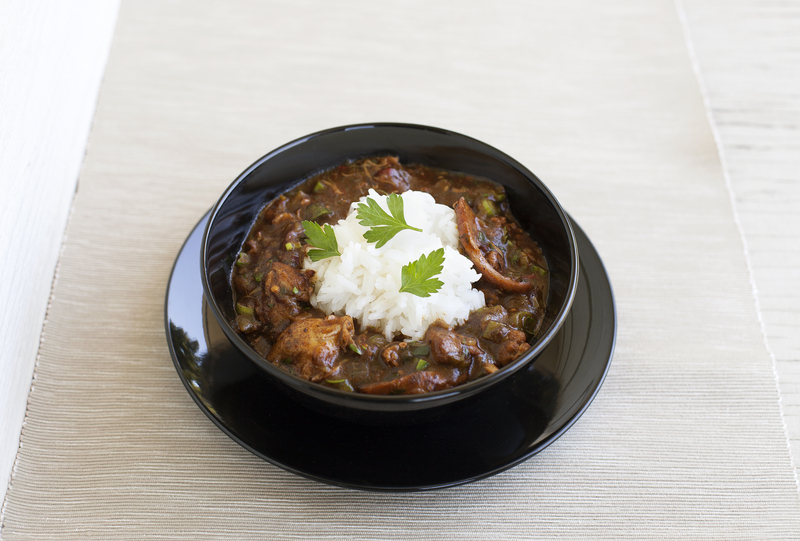 I came across this authentic recipe, of Chicken and Sausage style Gumbo on the NOLA site. Read the Handy Hints at the bottom before starting. In a non-stick pan cook your sausages. Once cooked remove them from the pan and set aside on paper towel. Meanwhile generously season your chicken thighs with the Cajun/Creole spice mix. In a large stock pot or french oven heat some vegetable oil and cook the dusted chicken on a medium to high heat in batches. Don’t overcrowd the bottom of the pot or your just stew the meat, instead of sealing it. Between each batch scrap up any carmelised spice on the bottom of the pot to ensure your roux won’t burn later, don’t throw it away just keep it moving with the chicken pieces. Place chicken on paper towel and set aside. To make the Roux, turn the heat on the Stock Pot down to low – medium, pour in the vegetable oil and pour in the flour in batches, whisking continuously. Once the Roux gets close to Dark Chocolate in colour, add the onions, capsicum and celery. Stiry through until they’re a bit wilted. Note this is also a tad scaring to a first timer, because you are essentially deep frying the vegetable as they go in, once their bulk and temperature overwhelms the heat of the Roux they’ll be fine, just try to tip them in in big batches. Whilst the vegies are cooking toss the Okra into your other frypan from the sausages and cook for a few minutes. Remove from the heat and drain the Okra on paper towel. Sprinkle with a little Cajun/Creole seasoning. Add the Sausages, Bay Leaves, Salt, Cayenne Pepper, Chilli Flakes and Thyme to the large stock pot, stir for a few minutes, then gradually pour in your heated stock. Bring to the boil and reduce to a simmer. Cook uncovered for one hour. Stir occasionally. Add the Chicken and Okra. Simmer uncovered for a further hour. Stir occasionally. In the Last twenty minutes cook the Rice. Just before serving toss in the Eschaollts and Parsley and stir through. In deep bowls, make a mound of rice and ladle your Gumbo on top. Garnish with a Parsley Leaf and serve with your favourite hot sauce. Rinse your rice in a sieve under cool tap water until the water runs clear. This will prevent glug and of all the gifted young Asian women who I lived with on campus with back in my uni days, not one of them did not rinse their rice. Place in a medium saucepan on the stove cover with water and the salt. Bring to the boil and then reduce heat to gently simmer for about 20 minutes until rice is tender. I couldn’t get Andouille Sausage where I shopped, I hunted around so I had to substitute with chicken as there was no pork either. You want to ensure there is no lumps and your Roux is smooth so don’t tip the flour in all at once. This is the most important stage of the process, I have read so many recipes and they all had one thing in common, the darker the Roux the better the Stew. So my approach was slowly, slowly on a lower heat I could control the caramelisation process better and not risk burning the Roux and having to start over, if you see black flakes (not the stuff from earlier – than its screwed) and you’ll have to start from scratch and miss all those earlier flavours from cooking the chicken). It took me 15 minutes to get to a Milk Chocolate colour, the lightest you’ll want to go, push it a bit further to get close to dark chocolate. This part is scaring because the pot starts smoking and you’ll want to quit. Be brave. I also added Okra, I felt it would be rather remiss of me not too and whilst I am here and can get it easily and fresh, the more veggies the better. One of the benefits of cooking your own meals from scratch on a regular basis is you have loads of various spices and sauces to play with that don’t expire like ready made sauces. 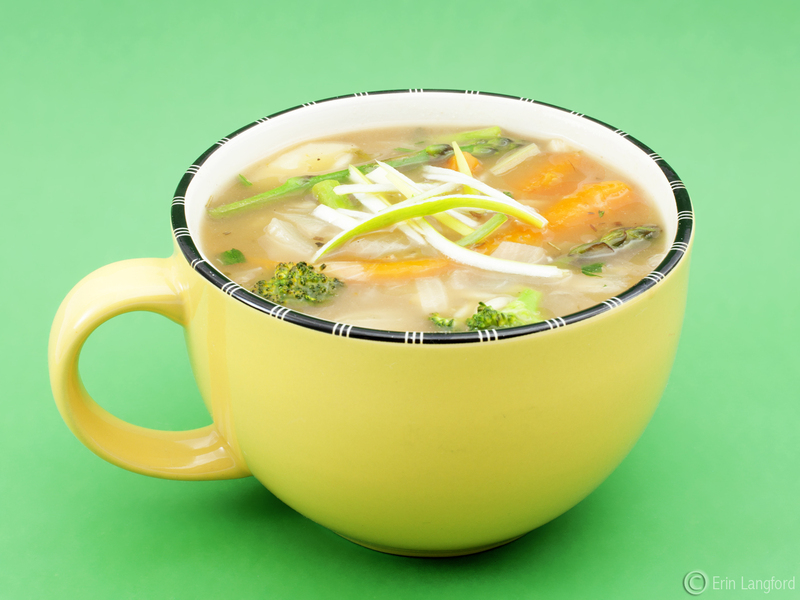 Have you noticed when you eat out and order an Asian noodle soup, there generally really simple; broth, noodles and a few veggies. Eating like this at home is economical as it’s a great way to use up leftover veggies. In a medium saucepan, heat the vegetable oil and saute the eshallots, shallots, ginger, chilli flakes garlic for three minutes. Add the mushrooms and cook for a further three minutes. Crumble in the stock cube, add the water and Shao Xing. Bring to the boil then gently simmer for two minutes. Cook the Rice Noodles to packet instructions in a second pot of boiling water. Once softened drain and pop in a deep bowl. Add the cream to the soup and simmer for five minutes. 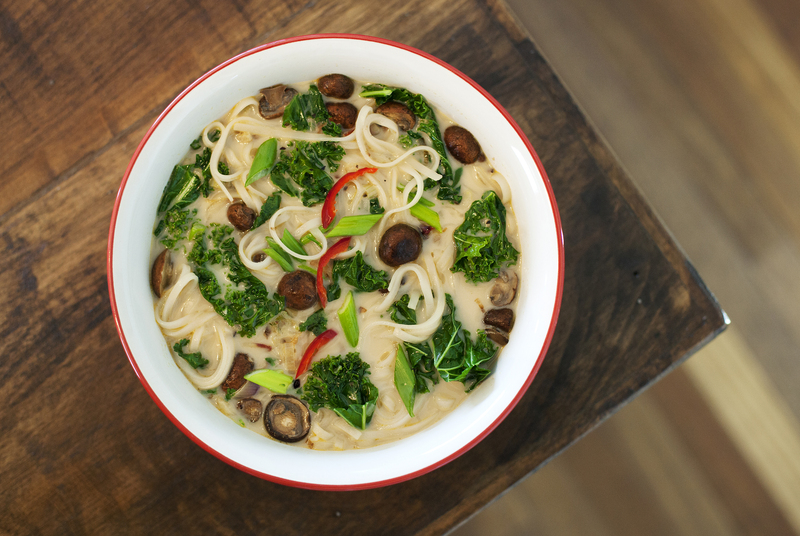 Remove the Star Anise and add the kale and coriander to the soup and then ladle over the noodles. Garnish with the Eshallots and Chill and a drizzle of Sesame Oil. Handy Hint: When adding soft greens like kale or baby spinach to meals like soups/pastas/stews, add them to your dish just before plating up. This way when you serve, your greens won’t look limp and unappetising but green and fresh. Also use whatever veggies you have if you wish, and if you don’t have asian style onions that’s absolutely fine, brown onion would work too. Remember this is about making the most of your kitchen leftovers! Rick Stein's Kuala Lumpur Laksa! One of my all time favourite meals is Laksa – but golly I’ve had some shockers lately which means I’ve had to make one myself cause no one else seems to be able to :( Mind you though this Laksa takes a lot of love to get it to the table so make sure your making it for people who either love Laksa or people you really love. Rick Stein’s Laksa (from Lifestyle Food site) is very well balanced with a kick of spice. Although his recipe is for four people I’ve suggested where a few more ingredients wouldn’t go astray. You’ll notice if you click on the link, the method looks different, it’s not really, I’ve just rearranged it to make it more practical than the way the original is written, as it had you dashing all about the kitchen. I read the recipe really thoroughly and then did the laksa steps in a more logical way. For the laksa spice paste, put the chillies into a food processor with the remaining ingredients and blend to a smooth paste. Set aside. Cut the tofu into 2.4x1cm pieces and fry in oil till crisp drain well on kitchen paper. While the tofu is browning, blanche your green beans and set aside. Once your done these, heat your rice noodles through. Peel the prawns, reserving the heads and shells. Heat 1 tablespoon of the oil in a medium-sized pan, add the heads and shells and stir-fry for a couple of minutes until they are crisp and golden. Add 1 litre of water, bring to the boil and leave to simmer for 4 minutes strain. When you’re monitoring your prawn stock it’s a good time to cut up your eschalots (for garnish), pluck your fresh herb leaves and set aside your bean sprouts. Might help if you put them all onto one plate (keeping separate) so when you layer up later it’s all ready to go. Heat 3 tbsp of oil in a large pan over a medium heat, add the spice paste and fry gently for 2-3 minutes until it starts to smell fragrant. Add the prawn stock, coconut milk, fish sauce, sugar and 1 teaspoons of salt or to taste, and simmer for 3 minutes. . Drop the peeled prawns and chicken into the curry soup and simmer for a further 2 minutes. Then add the Mussels. Drain and divide the noodles between 4 warmed, deep noodle bowls and top with the bean sprouts, cooked green beans and fried tofu. Ladle over the curry soup, trying to divide the prawns and chicken pieces equally between each bowl. Top each with the spring onions and mint and coriander. I love a simple easy dish that could be used as a main or tasty appetizer and this little Women’s Weekly recipe that I have amended just a tad knocks your taste buds outta the park. I found it in their Fast Soups cook Book. I’ve only made some minor adjustments like whisking rather than stirring to stop the lumpy lumps and also I’ve changed up the Dill to Parsley. Personally every time I eat Dill I think of MacDonalds. Also if you’ve gotten some gluten free bread handy, this makes a great soup to dunk your bread into once you’ve scoffed all the Mussels. 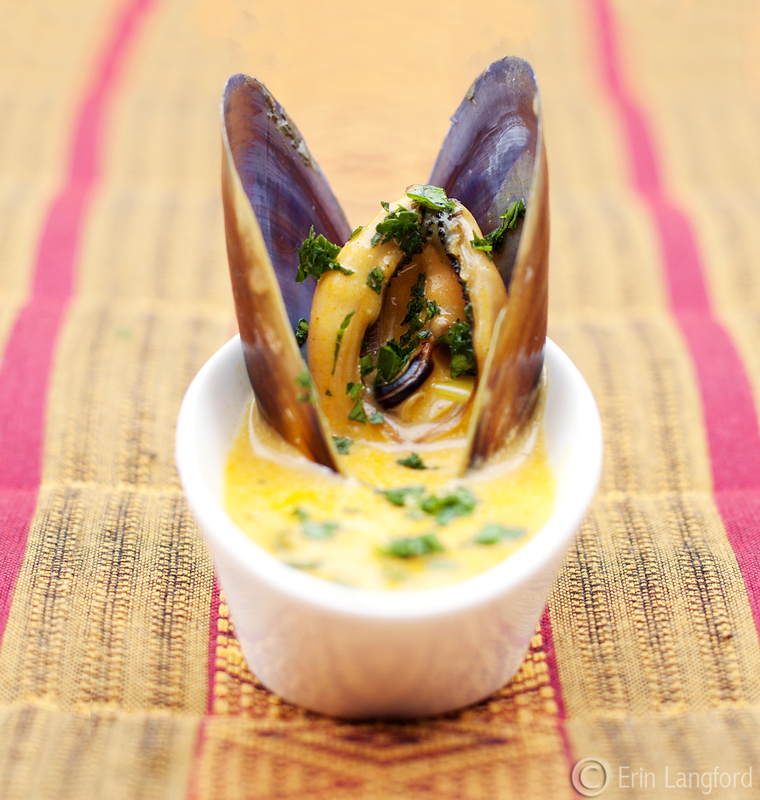 Pop the mussels and the cup of white wine in a large saucepan, now splash in some more wine, as a cup doesn’t look like much. Bring to the boil then simmer covered for 5 minutes. Place a bowl under your strainer and drain the mussels, reserve the wine for later. In your empty saucepan, melt the butter and cook the onion and curry powder until soft. Add the flour and whisk through for a few minutes. Cup by cup, add the hot water, the stock and the cup of reserved wine (toss the rest), keep whisking til they’re are no lumps. Add the tomato paste and simmer the soup (uncovered) until it’s starts getting a little thicker. Add the corn flour mix, once the soup has thickened some more, add the cream and the mussels. Simmer for a further five minutes (covered). Stirring occasionally to make sure all the mussels get coated at some point. Ladle the soup into large bowls and sprinkle with the parsley. Munch out with fresh gluten free bread. Handy Hint: add some peeled prawns and a few pippies if you want to make the dish more filling. Handy Hint 2: Got gross dangly bits? Here’s a Wikipedia link with a simple step by step process to getting rid of the mussel’s beard. Pho Ga, Pho sure! From Gwyneth Paltrow's site, Goop. I was reading Gwynee Paltrow’s Blog Goop (I’ve subscribed to her Newsletter) and there was a phabulous recipe idea for leftover turkey, so I tried it with a BBQ Chook from the grocery store. When cooking the stock my kitchen just smelt so fricken amazing I couldn’t wait for those 20 excruciating minutes of simmer time to be up. 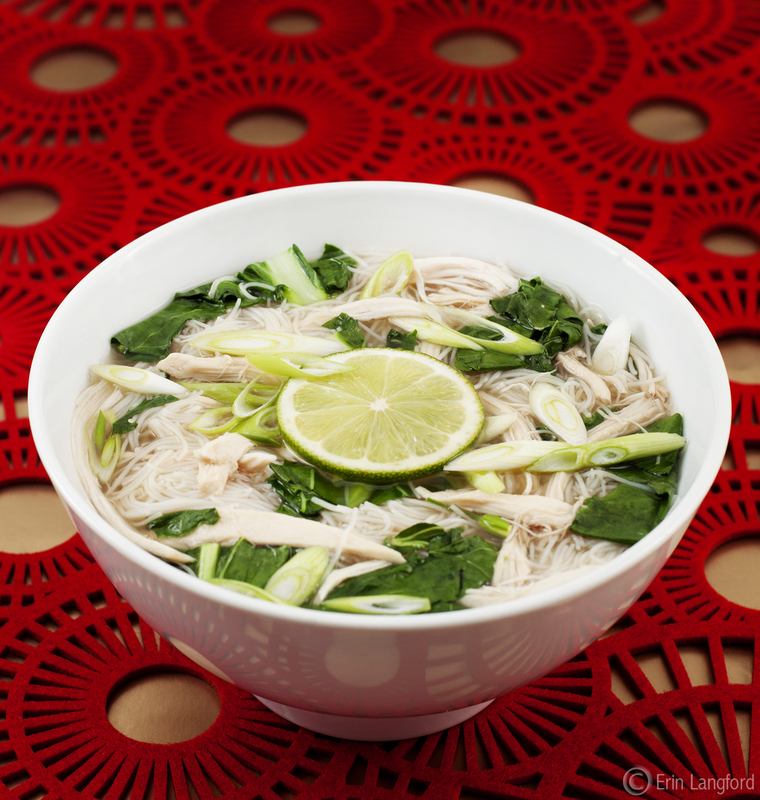 This is the best Pho hands down to make in your kitchen in under thirty minutes. I’m going to let you in on a little secret, the trick to the perfect broth, I know I’ve made this dish probably 60 times or more is to really dry heat those spices til they’re almost smoking. FYI, the ground cinnamon will go to black, that’s fine. Then toss the spices straight into the stock. Note, to Deviate from this recipe and not change up the flavours too much, I love to allow Munchers to add their own herbs and chilli as you would in a Vietnamese restaurant. If you prefer this way of eating Pho, don’t garnish the soup with the lime, eschallots and coriander as listed above try the alternative bowl garnish below. Pour the chilled wine and take a sip. Don’t forget to sip regularly throughout the prep/simmer process. In a small saucepan cover the Vermicelli noodles with hot water and gently simmer til softened then strain. Divide the noodles amongst two bowls. Pour the stock into a medium saucepan and have it somewhere near your chopping board so you can add the Eschallots (chopped green bits only), Ginger, Fish sauce, and Brown sugar as you chop and measure. Set a side for a moment. In a wee pan heat through the Coriander seeds, cinnamon stick, cloves and star anise for a few minutes. Be gentle it burns easily and you’ll need to start over if you get them smoking too much. Once they smell a little aromatic take off the heat and plunge into the saucepan with stock etc. Now bring the stock to a rolling boil and then reduce heat to a gentle simmer. Cover and brew away for twenty minutes. Place a large bowl under your sieve/strainer and pour off the stock, return the stock only to the saucepan along with the chicken and the chinese broccoli, gently heat through for a few minutes. Ladle over stock mix over the noodles. Either serve as pictured : Top with a slice of lime, few sprigs of coriander and the sliced eschallots. P.S If you’ve finished your wine don’t forget to top up your glass and take it to the table with you. I never really understood it’s name when I was younger, I mean there is no cream in chicken. I wrote this recipe down from a newspaper many years ago and thought to make it today, my notes were so rough that measurements were missing from the ingredients so I can’t even credit the original cook unfortunately, but here it is for you. 1 bbq/roast chook, chopped into small pieces. Melt butter in a soup pot, then toss in the celery, garlic and onion and cook gently for ten minutes. Be careful not to caramelize, you want the soup to stay white. Gradually add in the flour and mix through, cook for five minutes also gently as you don’t want the soup to taste floury. Then add the stock cup by cup, continuously whisking away too prevent the soup getting lumpy. Season with salt and pepper. Add the creamed corn, the cream, the parsley and the chicken. Simmer for a further ten minutes. Serve with a dollop of sour cream and some tasty gluten free bread to mop the bowl with. Craving a slow cooked beef stew with less effort than a Julia Child recipe I came across this on the Taste.com site. 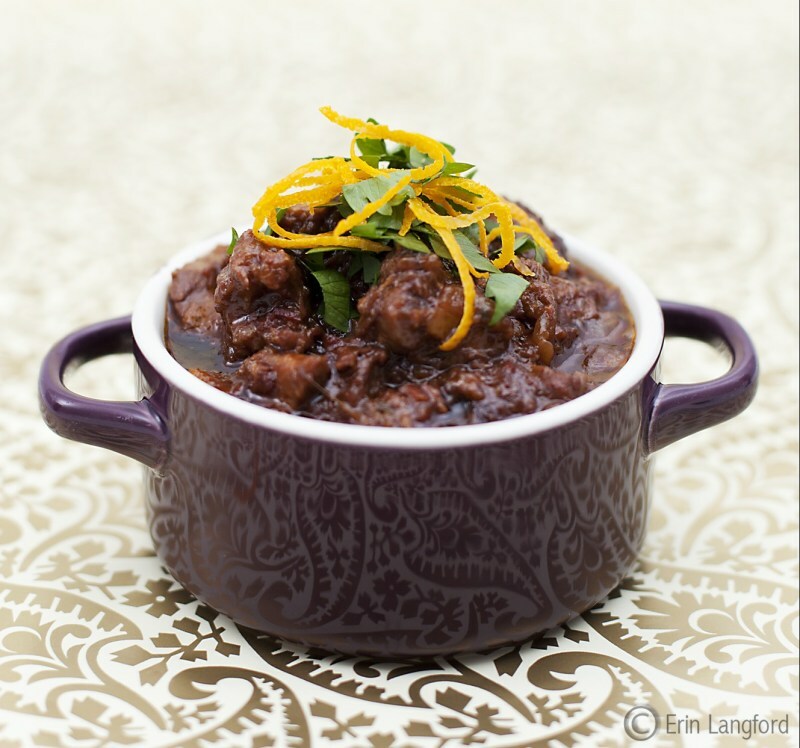 The orange zest, dark choc and cinnamon really seemed like a fantastic combination and a nice twist on your typical savoury slow cook options. Also it’s almost a one pot stew so it all ends up in your casserole dish. The only thing I’ll do differently is instead of nicking the boyfriend’s last glass of Beaujolais I’ll pour in a red wine with more body to add a little more depth to the sauce. I served this with mashed potatoes, next time I will try quinoa cooked in a little beef stock/water combo for something different. I also did most of the cooking the day before. Read through the recipe and you’ll see why as the Taste site suggested chilling for 6 hours, I just thought it easier to do overnight. Heat your casserole dish over high heat. Add the pancetta and cook, stirring, for 2-3 minutes or until golden. Transfer to a bowl. Pour in a little of the oil and add one-quarter of the beef and cook until brown on the outside. Transfer to the bowl with the pancetta. Repeat, in 3 more batches, with the remaining beef. When I stirred the beef occasionally I use a chunk to help remove the caremelised oil on the sides of the dish, this way it wouldn’t build too much in thickness, thus preventing burnage in the oven later. Add the vinegar to the dish and cook, stirring to dislodge any bits that have cooked on to the base, for 1-2 minutes. Pour over the beef mixture. Heat some more oil in the dish over medium heat. Add the onion and garlic and cook until soft. Add the beef mixture back to the dish with the onions, stock, wine, tomato paste, cinnamon, thyme, orange peel and chocolate. Lay a piece of foil just over the top of the sauce and cover with the lid. Bring to the boil. Bake in oven for 2 hours or until the beef is tender. Keeping an eye on it to make sure your gravy doesn’t disappear. Set aside for 15 minutes to cool. Place in fridge to chill. I actually cooked this Sunday afternoon, so my stew infused overnight, it meant come Monday after work most of the cooking was done. An hour before you’re ready to eat preheat oven to 160°C. Use a spoon to remove any fat from the surface of the stew. Turn the stove onto a low heat and warm the stew, stirring, until it is sauce again. Cover with foil again and lid and bake in oven for 45-50 minutes or until the meat is tender and the sauce thickens. Ladle to stew onto a bed of mash/quinoa/polenta and sprinkle the stew with parsley and orange zest to serve. A simple vegetable soup perfect for cooler Spring evenings. It’s so variable just add the vegies that you like or follow mine exactly below. The fact that nothing really has to be prepared nicely means it’s really quick to prep and cook. 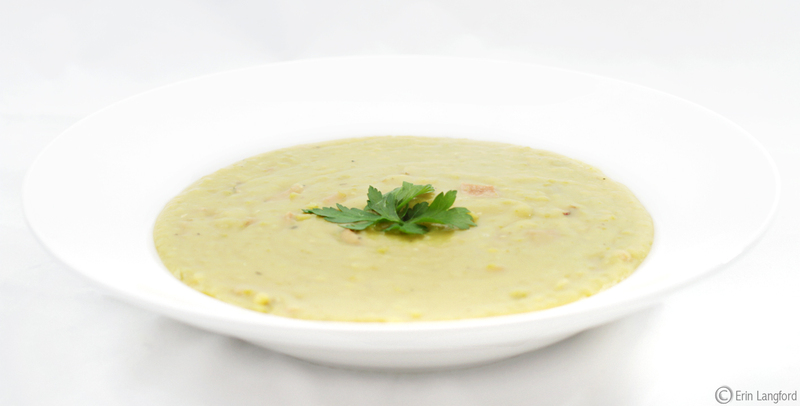 The risoni added to the soup helps in thickening up the thin base with it’s starchiness. Heat olive oil in a pan and add the onion, garlic, mixed herbs, potatoes, celery, and carrots. Cook for five minutes then add the risoni and stir through. Once the pasta is covered in the vegetable juices add the stock and water and bring to the boil. After five minutes reduce the heat to a gently simmer and continue cooking until the risoni is cooked. Check the seasoning and if required grind in your salt and pepper. Add a dash of soy sauce or tamari and toss in the asparagus, broccoli and parsley cook for a further minute and then serve up into large bowls or soup mugs. Garnish with the eschallot for fresh crunch. I got this recipe from That’s Life! 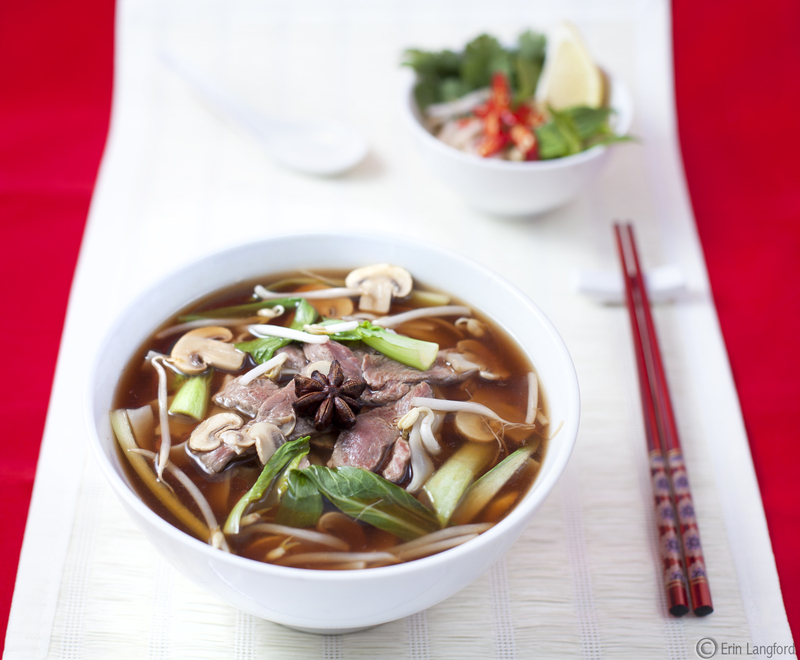 magazine and tried it out as it looked like a really quick and easy recipe for Beef Pho. It was actually a recipe submitted by one of their Readers, Polly Hemming from the NT. I made it exactly to the instructions (as far as flavour of the soup broth goes) and added a few other bits to bulk it out a bit, I have a huge appetite. The whole process didn’t take long, and I took inspiration from some of the Vietnamese restaurants I’ve eaten in for the bowl of goodies that goes on the side. My only criticism was that I felt the soup was a little too “beefy” for me, next time I will do half beef/half veggie stock. Meanwhile place Beef stock, boiling water, ginger, star anise, lime juice and fish sauce in a large saucepan and bring to the boil, then allow to simmer for 10 minutes. Take the ingredients in the For Later section and divide them up amongst four mini bowls (one per person). This allows the muncher to add as much or as little herb, spice and lemon juice as they like whilst they eat, the herbs stay fresh and tasty and don’t get overpowered by the Pho stock. In the last two minutes of stock cooking add the mushrooms. Divide noodles into bowls and top with the raw beef slices. Just before ladling the soup, add the baby bokchoy to the stock to allow the soup to infuse the veggie for about 10 seconds. Ladle the soup with the mushrooms and baby bokchoy over the noodles and beef, the hot stock will actually cook the meat. Sprinkle the soup with a handful of bean sprouts per bowl. Serve the soup with your mini herb bowls and munch out. I love mushrooms so much! Place a large stock/soup saucepan on the stove and bring to a low to medium heat. Melt the butter gently and toss in the onions, garlic, herbs and seasoning. Fry with regular stirring until onion and garlic are really soft. Add the carrots, celery, lemon juice and zest and cook til vegies are tender. Add Mushrooms and mix well. Tablespoon by tablespoon add the gluten free flour, mix thoroughly. Pour in the stock whilst stirring and turn up the heat to bring on a boil. Pop your lid on this will make things happen faster. Once boiling, turn down to stove to a simmer and simmer gently uncovered for 10 minutes. Turn down the stove to the lowest heat possible and using a slotted spoon try to remove 1/3 to 1/2 the mushroom slices and pop in a bowl. Trust me it may seem totes unnecessary right now but you’ll thank yourself later. The vegies will be hot so use a teaspoon to pop the carrots and the big chunks of onion and celery back into the soup pot. This will take about five minutes or so. Now use a stick blender (if your lucky enough to have one) or transfer the soup to a blender (you may have to do this in a few stages) and blend the soup til silky smooth (about three minutes). 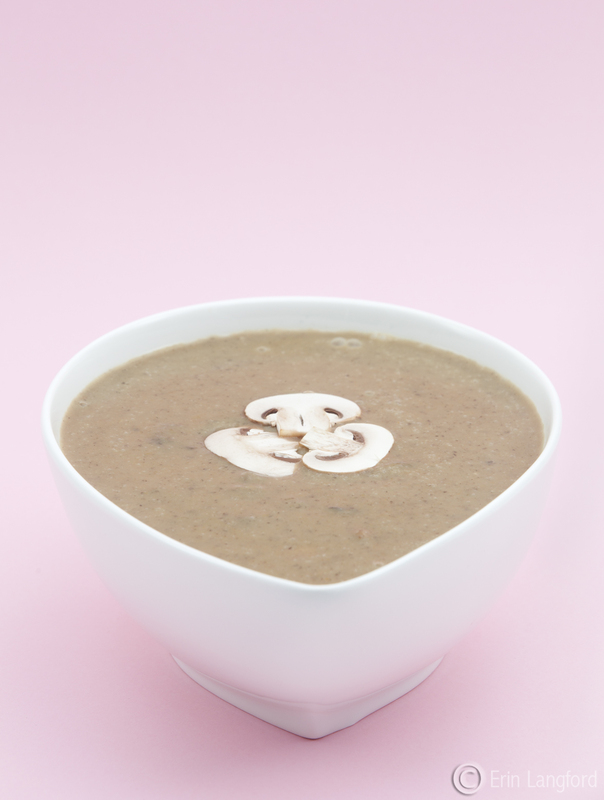 Pop the mushrooms back into the pot with the soup and bring to a gently simmer. Add the chicken breast and stir the soup until chicken is cooked through. Around five minutes or so. Take a piece of chicken from the soup to see if it’s cooked if you’re not sure. Finally turn the soup heat down to lowest heat and allow the soup flavours to infuse the chicken whilst you get the bowls and cutlery out. I love making this soup, because it’s perfect if you’re on a budget and most things will already be in your cupboard all you will need to purchase is the corn and the chicken. 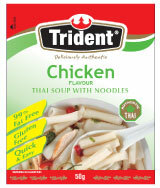 Although this is great, it will never beat your Mum’s Chicken Soup recipe. 2 tbs corn flour and a little water to mix it in. Add a little olive oil to a large soup pop and once warmed through toss in the onions, garlic and ginger, saute until soft. Now shake in the salt, pepper, chinese five spice and sesame oil. Stir until fragant. Add the stock and the water, cover and bring to a rapid simmer. Throw in the chicken and cook for a few minutes until the outside seals. Pop in the corns and the soy and bring the soup down to a gentle simmer. Bubble it away for about 15 mins or so. Add the corn flour to help thicken the soup and then stream in the egg whites. I absolutely love Pumpkin soup it’s so simple to make you could definitely do this on a weeknight after work and save leftovers for a lazy day. 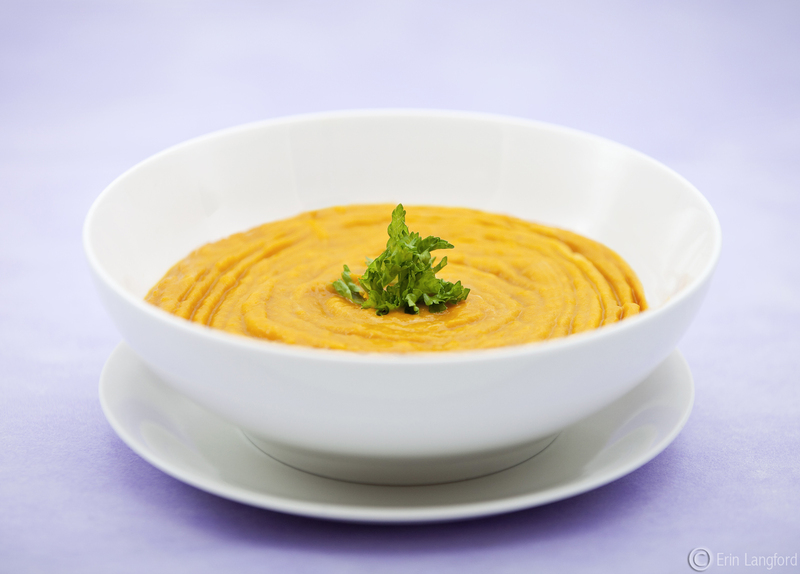 I always use a variety of pumpkins in order to give depth of flavour to this soup. This soup is super filling, especially if you make it to pass my fork test (ie you can scoop it out with a fork with no drips). In a large soup pot warm your butter and add the onions, garlic, salt and pepper and sweat. When the onions have softened add your chunks of pumpkin and sprinkle over stock powder and cover with water. Cook until pumpkin has softened. Before straining your pumpkin pop a large bowl under your colander to retain the pumpkin stock. Strain pumpkin. Place 1/4 of the pumpkin back into the soup pot and mash until relatively smooth. In the blender I add a little cream to help lubricate the blades and then a large wooden spoonful of pumpkin. Blend. When the rest of the pumpkin do this bit by bit, it’s more efficient and easer on your blender. Once each bit has been blended add this back to your soup pot. Once all the pumpkin has been pureed return the soup pot back to the stove and heat through. Add the leftover pumpkin stock gradually until the soup reaches a consistency you prefer (I used 250 ml of pumpkin) and check the seasoning and the texture. Now is the time to add anymore cream or salt and pepper. Ladle into bowls and serve with your favourite gluten free bread. Note: The pumpkin varieties and weight doesn’t have to be exact, this just happens to be the sizes I was able to pick up, you can cook less pumpkin, you’ll just get less soup that’s all. This is really a recipe by feel rather than preciseness. Handy Hint: Freeze your left over pumpkin stock for the next time you make this soup rather than using a generic vegie stock. I have even used the pumpkin stock when making a spring vegetable soup to add another dimension to the flavour. Minestrone soups is one of those versatile, easy to make meals that as long as you have the basics in there, you can’t muck it up. Really what could be more delish than tomatoes and bacon? The ingredients list looks a little riduculous when you write it all out but it’s not, it’s just loads of Mediterranean veggies :) and it makes 6 large dinner serves. This won’t take longer than 30 minutes from start to finish. In a large saucepan or soup pot heat a little olive oil and saute off your Onion and garlic, season with salt and pepper and add the chilli and mixed herbs. Once the onion has softened mix in the bacon and cook til its warmed through. Add all of the diced veggies and mix well, cook for about 4 minutes until the veggies start to soften a little. Now add the tomato tins, stock, water, pasta and tomato paste and stir through. Bring the soup to a simmer and cook until the pasta and veggies are done. Now check the seasoning. Add a little more chilli flakes if you’re not experienceing that little lip tingle. Just before serving toss in the fresh parsley and stir through. Ladle into big bowls and feel all Italian Mamma in your dining room. Fun Fact: The starch from the pasta really helps to thicken up the soup so it’s not super runny. Handy Hint: Be careful of the mini pasta shape you choose to use, you don’t want something with holes in it (like macaroni) or the soup will get trapped and you’ll probably burn your tongue. The perfect healthy and very inexpensive lunch that you can make at work. I have made this plenty of times and I always receive compliments from strangers in the building. I reckon each bowl is only around $3.00 a pop. So if you have a microwave at work, invest in an inexpensive microwave/steamer bowl or if you work from home you can do this on the stove. Add your soup sachets, the rice chip noodles and vegies to the microwave bowl, cover with water and cook in your microwave for approximately four minutes. Stir once to make sure rice noodle chips separate. That’s it. All up it probably doesn’t take more than five minutes to make, which leaves you with plenty of munch and relax time on your break. Other Vegies and things I have added to that work really well are; Asparagus, Bean Sprouts, Bok Choy, Egg white, Sugar Snap Peas and leftover BBQ Chicken. I have also added to boost flavours from time to time; Soy Sauce, Sesame Oil and Chilli Oil (seen in pic). If you have a fridge at work why not take your vegies in whole and cut them up as you need them or alternatively you can prep them at home and keep them in a ziplock bag, til lunch time. Or so the Starks keep telling us. So why not get stuck into the kitchen and make some hearty soups to help you prepare for Winter’s imminent arrival. Store your leftovers for laters and you’ve got a readymade meal for when it’s too cold and you can’t be bothered cooking. 3 Cups of Split Peas (you don’t need to soak the dry peas but the longer you are able to soak them, the faster they’ll break down in your soup and decrease your cook time). Sweat the Garlic and Onion on a low heat. Once they’ve softened add the chopped ham and warm through for another five minutes or so, then add the Split Peas, Water and Bay leaves and season well. Bring the pot to the boil and cover. DON”T FORGET TO STIR REGULARLY. Cook until the peas have broken down and the soup is super thick. Nom Nom Nom. Helpful Hint: When cooking soups always try to use a thick bottomed saucepan/soup pot. If the metal is too thin, high heats can warp the metal and cook your meal unevenly and you’ve got a super high chance of some serious burn-age! This is a perfect mid week meal. Few ingredients, little prep time and the fresh flavours pack a punch for the small effort that goes into the bowl of spicy goodness. I make this dish at least every fortnight, it’s so easy that you only need to read through the recipe the first time you make it. Takes no longer than 20 minutes all up too! And if you wish to make your own Chilli Jam I have a recipe for that here. Place a small saucepan on the stove and bring the stock, chilli and ginger to a gentle simmer for about 10 minutes (now is a great time to slice the chicken). Meanwhile place rice noodles in a large saucepan and cover with boiling water, simmer also until cooked. Strain. In a frypan bring the oil to a high heat (smoking), then add the chicken pieces one by one so they have room to colour, and char a little. I like to work from left to right of the pan so by the time you fill out the pans space the chicken on the other side on the pan is almost ready to turn over, it’s easier to keep track of the meat’s cooking process. Place noodles in a large bowls, ladle over the broth (keep the chilli in ginger there, no need to strain), spread the baby bok choy around the bowl and pile up the chicken. Garnish with eschallots and coriander. Handy Hint: Don’t forget to make sure the oil is super hot – almost smoking to get that nice little char. Also if you wish to to make your own Chilli Jam Recipe click here. 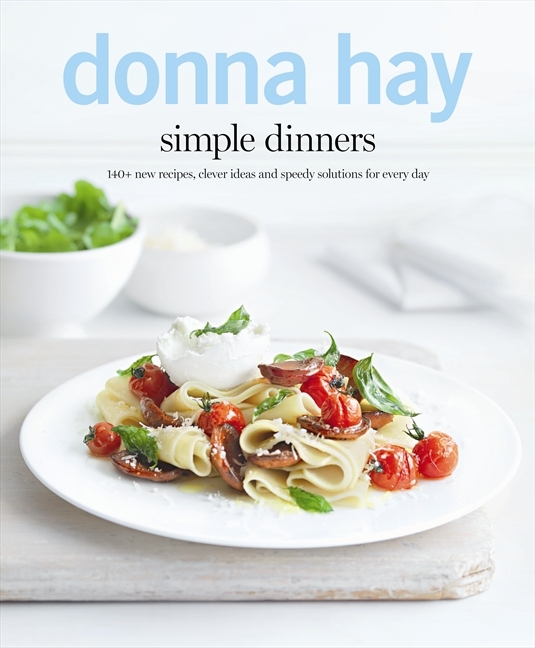 From Donna Hay’s Cook Book Simple Dinners.